Professor Dimitri Feys is studying ways to make self-consolidating concrete suitable for bridge building and other construction projects. A Missouri University of Science and Technology researcher is studying how to make concrete that can be placed without a lot of human intervention, and that can be poured in hard-to-reach places where people can’t easily manipulate it. 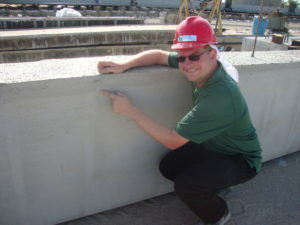 Dr. Dimitri Feys, assistant professor of civil, architectural and environmental engineering at Missouri S&T, is working with self-consolidating concrete to produce beams that can be used to construct bridges, parking garages or other construction. 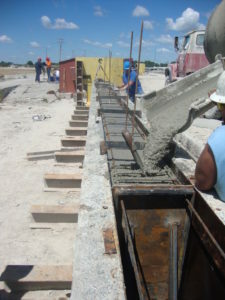 Self-consolidating concrete is a type that flows easily in concrete forms or molds. “The main use of this concrete is in Japan and Europe — 100 percent of the pre-cast industry in Denmark uses this type — and it slowly is making its way in the U.S. market,” he says. But there are challenges, Feys says. Chief among them is figuring out a way to keep the concrete homogenous throughout the produced structural element. That’s important because the aggregate — the gravel or rocks used in the mixture — need to be uniformly distributed to ensure even strength throughout the product. If the gravel sinks to the bottom as the concrete flows through the form — known as dynamic segregation — it negatively affects the finished product’s quality in strength and durability. The distance problem needs to be explained as a function of time, he says. Workers at Coreslab Structures in Marshall, Mo., pour a beam during one of Dr. Dimitri Feys tests. Feys can manipulate the concrete’s rheology, or flow, by changing its ratio of cement, aggregate, sand and water. And he can further change its properties by adding super-plasticizers, primarily polycarboxylate, which are essential for the concrete to flow easily. The challenge is to incorporate the proper amount of super-plasticizer for flowability while keeping the aggregate well dispersed. He uses core samples to test the beams for gravel distribution, strength and an adequate distribution of air bubbles, essential for freeze-thaw durability. Feys and Dr. Julie Ann Hartell, assistant professor of civil and environmental engineering at Oklahoma State University, used ultrasound testing techniques on the produced beams to evaluate homogeneity. “Inferior properties in specific zones of precast beams can lead to reduced durability, leading to a premature need for repair or replacement, which in the end will cost taxpayers more money,” Feys says. The ultimate goal is to make self-consolidating concrete a common product used in the U.S., he says. Research team members from Missouri S&T are Jason Cox, senior research specialist; John Bullock, engineering technician I; Aida Margarita Ley Hernandez of Ciliacan, Mexico, a graduate student in civil engineering; and Sara Vanhooser of O’Fallon, Missouri, a senior in civil engineering. The project is funded by the U.S. Department of Transportation through the Research on Concrete Applications for Sustainable Transportation (RE-CAST) consortium, in which Missouri S&T partners with Rutgers University, Southern University, the University of Illinois at Urbana-Champaign and the University of Miami.